We review the Sony Cyber-shot RX10 Mark IV, the latest ultra-zoom bridge camera from Sony, with high-speed shooting. 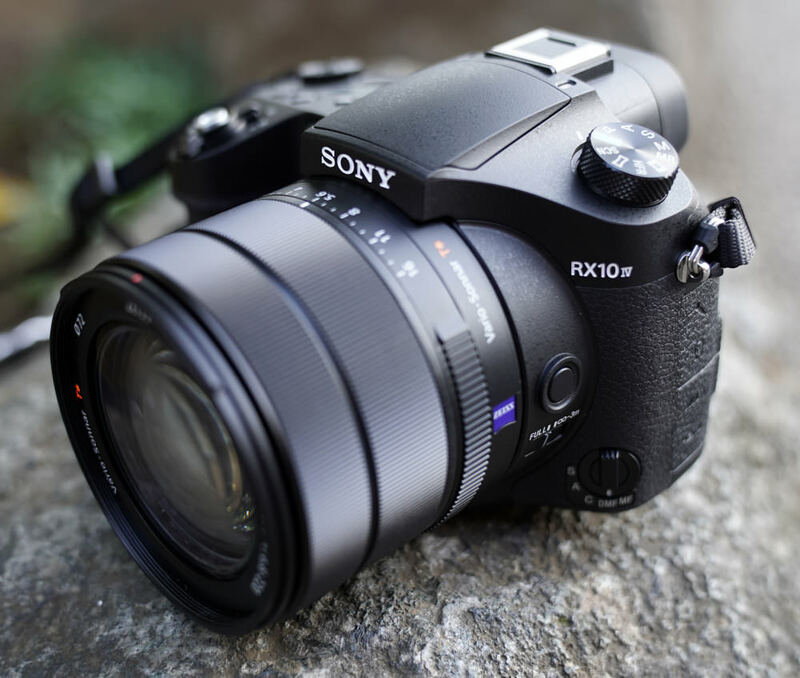 The Sony Cyber-shot RX10 Mark IV is an ultra-zoom bridge camera with a 25x optical zoom lens. The Mark IV updates the Mark III, with an updated processing engine to give 24fps continuous shooting, and phase-detection focus is built-in to the sensor, to give the World's fastest AF performance, of 0.03s. The camera has Wi-Fi, NFC, and Bluetooth built-in. The Sony Cyber-shot RX10 Mark IV is a premium priced ultra-zoom bridge camera with a bright Zeiss 25x optical zoom lens that gives the equivalent of a 24-600mm telephoto zoom lens, with an f/2.4 to f/4.0 aperture. Optical SteadyShot (optical image stabilisation) ensures sharp photos when shooting in low light or when using lots of optical zoom. You can focus on subjects just 3cm from the front of the lens when shooting macro photos. If you're looking for an ultra-zoom camera, with a larger than normal 1inch sensor, then there are a number of alternatives to consider, all featuring a 20-megapixel 1inch sensor. Compared to the Canon Powershot G3 X, Panasonic Lumix FZ2000, and the previous model, the RX10 Mark III. The camera offers an automatic shooting mode, numerous scene modes, plus full manual controls so that you have control over the shutter and aperture speeds. There is a manual aperture ring available around the lens, and this can be switched to clickless if required. There is side access to the memory card slot, which accepts either Sony Memory Sticks or SD / SDHC / SDXC cards. 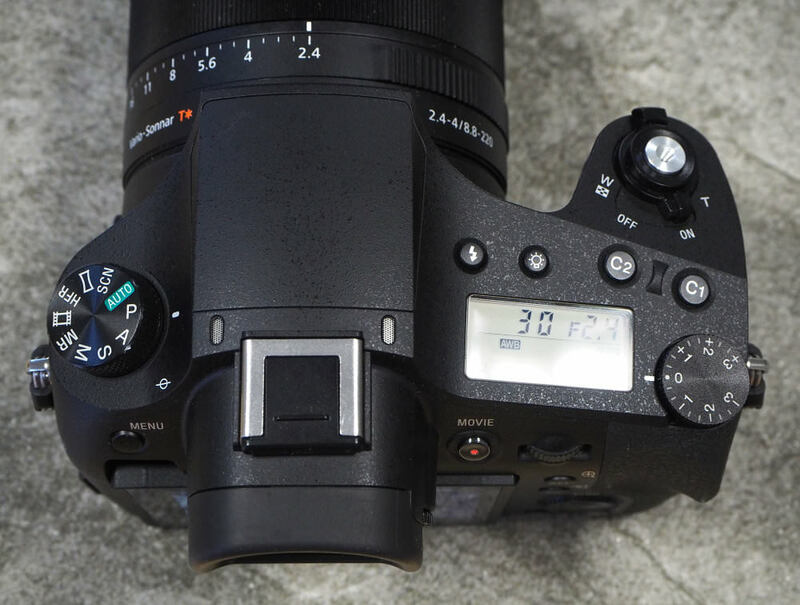 The weather-sealed body resembles a Digital SLR (with a top LCD screen as well), and the camera has a weight of 1095g (with battery and memory card). The camera features diffraction-reducing technology, designed to maintain clarity even when using smaller apertures. 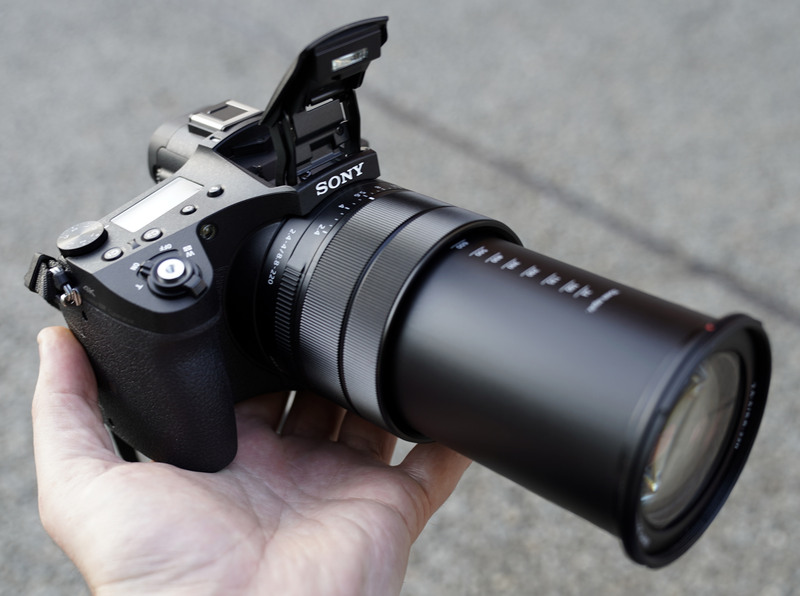 Sony has also worked on the image processing, to improve image quality when using the telephoto zoom lens. Wi-Fi, NFC and Bluetooth is built-in so that you can connect the camera to your smartphone or tablet using Sony PlayMemories Mobile (available for Android and iOS). 4K video is available at 30/25/24fps* with optical zoom and stereo sound, and you'll also find microphone and headphone sockets on the side. High-speed video is available at 250fps (1824 x 1026), 500fps (1676 x 566) and 1000fps (1136 x 384), for a limited amount of time, which can be extended when shooting at a lower resolution. * Frame rate options available change depending on whether you select NTSC or PAL. Build quality and handling of the RX10 Mark IV is excellent with the camera featuring a large rubber hand grip surrounding the right-hand side where you hold the camera, and on the back, this continues all the way round to where there is a shaped area for your thumb to grip. Above the thumb is where you'll find the exposure compensation dial. Holding the camera with two hands is recommended due to the size and weight of the camera which is 1095g (including battery and memory card). The left-hand side of the camera (viewed from the rear) also features a rubberised grip that goes round to the front of the camera. There is also a focus hold button on the left-hand side of the lens, plus a new focus limiter switch. The focus switch has been updated, and now includes A (Automatic), in addition to Single, Continuous, DMF, and MF. 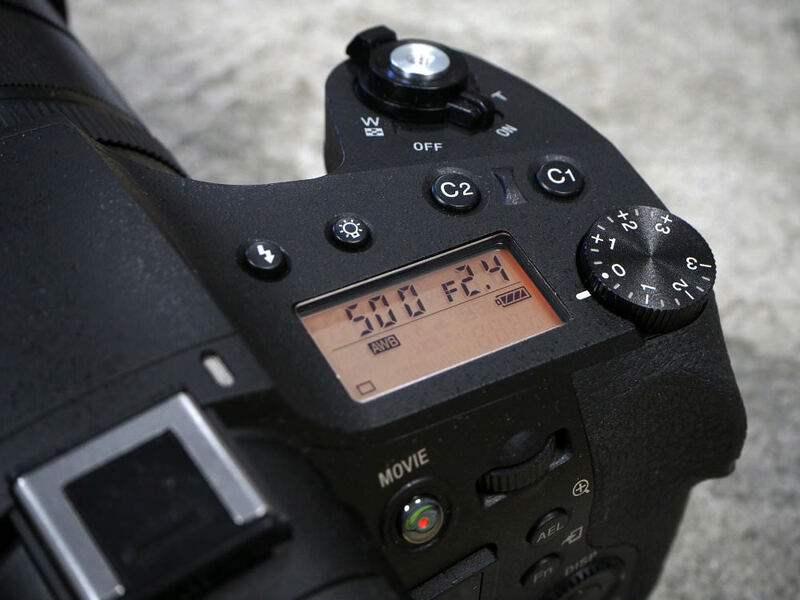 The camera features one custom mode ("Memory Recall"), plus an "HFR" mode, which stands for High Frame Rate (Video) on the mode dial. The delete button is customisable as the third custom button (C3), with two customisable custom buttons on top (C1 and C2). The 4-way direction pad on the rear can also be customised, along with the AEL button, and control wheel on the back. Surrounding the lens is the focus ring, zoom ring, and a manual aperture ring. The zoom ring controls the power zoom lens, and the aperture ring lets you set the aperture between f/2.8 and f/16, making the camera feel like a more traditional camera. In addition, the aperture clicks can be switched off, letting you smoothly and silently change aperture during video recording. You can set the shutter speed using the rear scroll wheel, for manual control over exposure. Markings on the lens barrel show the focal length at a glance. The top left of the camera features the mode dial, and the camera features a sensor plane marking so you know where the sensor sits in the camera. On this side, you'll also find the covered microphone and headphone sockets, as well as the Multi(USB) connection and HDMI port. 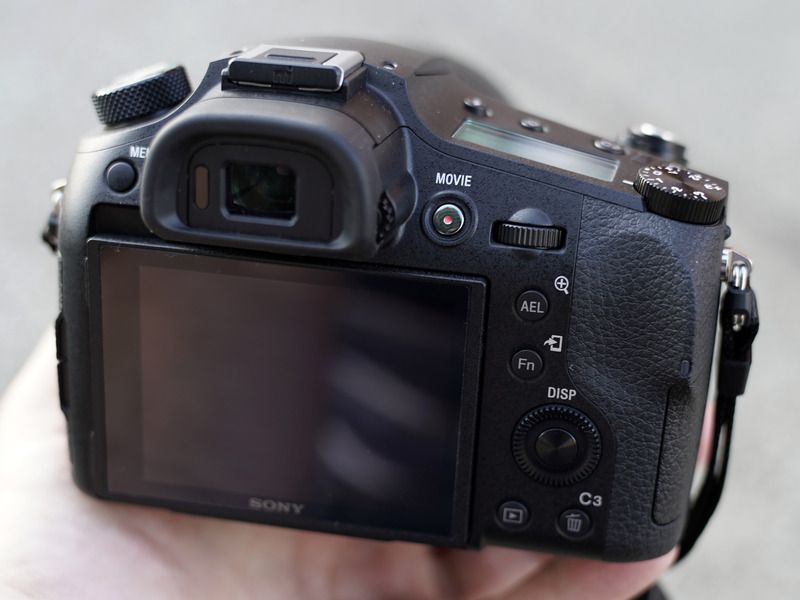 The Sony multi-interface hotshoe means the camera is compatible with a number of Sony accessories. A small pop-up flash is included, as well as a good size LCD screen (with illumination button above it), which gives shooting information, as well as remaining shots and battery life. The shutter release features a thread for a screw in shutter release cable, and there is a zoom rocker surrounding the shutter release button, with the on/off switch behind. Menus – The camera has updated menus, which hasn't really improved the menus that much. Some of the menu screens show only one item on a page, and you have 14 pages of menu items for Photo1 (the RX10 III had 9 pages), so it can take some time to scroll through all the items to find what you want, and the menus could do with tidying up. For example, why not put all the video options under a "Video" section? One nice feature is that you can put all of your favourite settings under "MyMenu". The function button brings up a set of options on the screen, that can be quickly changed without having to go into the menu system, and these options can be customised. On the back, the tilting rear screen has a high resolution of 1440K dots and is clear to see, with a recessed gap to make it easier to pull the screen out when you want to tilt it. The electronic viewfinder features a 2360k dot resolution, dioptre correction, as well as an eye-detection sensor so that when it's held up to your eye it will automatically switch to the viewfinder. The viewfinder is clear and bright and updates smoothly and is of a good size, even when wearing glasses. The focus point can be set over a wide area of the screen, almost into the far corners, and you can use the touch-screen to set the focus position. The phase detection area has 325 focus points, covers 65% of the frame, and is marked with rounded corners on-screen. Wi-Fi features - The camera features NFC (Near Field Communication), low-power Bluetooth and built-in Wi-Fi so that you can simply touch the camera to a compatible NFC enabled smartphone to setup the connection. The Sony PlayMemories Mobile app will then allow you to remotely control the camera, as well as download and share photos from the device. Sony PlayMemories Apps are no longer available. This seems to have disappeared from a number of recent Sony cameras, with no explanation. However, considering the apps cost money, for features that other cameras have built-in, it's no great shame. Assuming that Sony start building these features into future cameras. Battery life - Battery life is rated at 400 shots according to Sony / CIPA test results, which is a slight drop in the number possible, however, it will also depend on how much you shoot with flash, or how much you use continuous shooting. 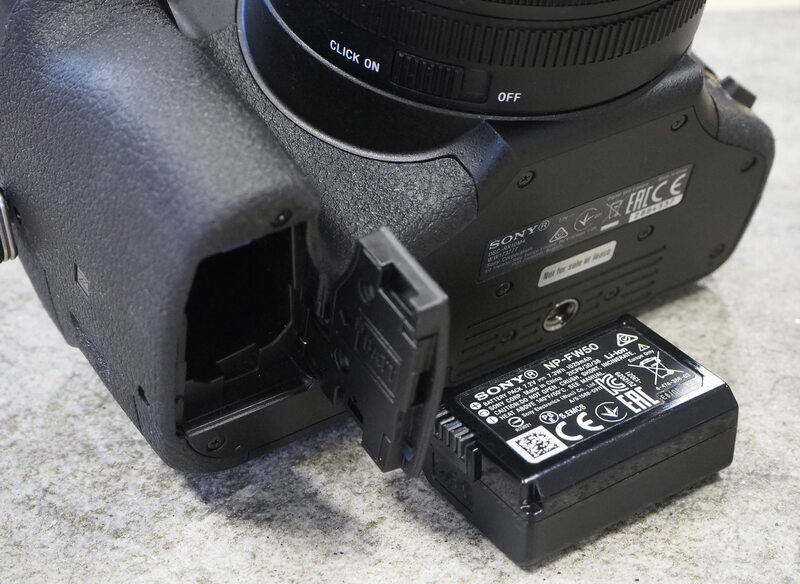 The camera battery is charged using a MicroUSB cable with the battery in the camera. This means you can easily find somewhere to plug in and charge the camera, although if you wanted to charge a spare battery you'd need to buy a separate charger. & £1800 ?????? ?......sorry Sony, not for me ! !.......lovely image quality though !. I would like to see some real world images at the 600mm end at various apertures. It was the benefit of having versatility, compactness and a fully sealed sensor which made these cameras a choice for people who travel or can not be spending a fortune of lenses. 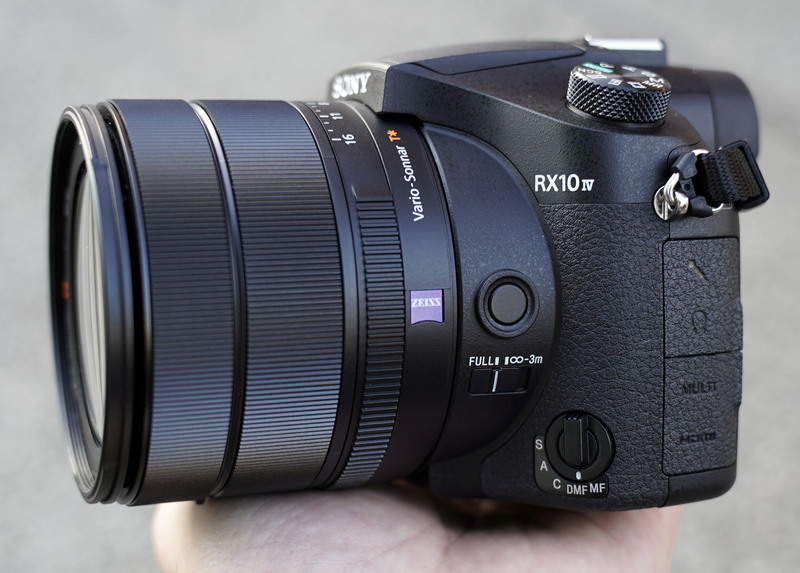 RX10 is a true monster in everything, performance, price, looks and heaviness. If early models were expensive, the IV is ultra expensive. Marketing-wise and design-wise Sony would have dropped them from production if they were market flops. On the fourth incarnation I think we must thank those who buy them and hope that our next lottery ticket will be a million dollar winner. It is very expensive, but you can buy a camera with similar specifications for much less, such as the Panasonic FZ2000 or FZ1000. These also have a 20MP 1" sensor, and it's quite probably exactly the same sensor as this one, the differences being in zoom range and video features. Cameras like these are the future, really. The traditional SLR will inevitably fade away as fast, responsive and high resolution electronic viewfinders mean there is an alternative to the reflex mirror and prism system - the SLR system only exists because it's a convenient way of seeing exactly what the film or sensor sees through the lens, so if there is an accurate enough way of seeing this by directly interrogating the sensor then that's going to take over just as the camera phone displaced the cheap point and shoot. It is very expensive, but you can buy a camera with similar specifications for much less, such as the Panasonic FZ2000 or FZ1000. These also have a 20MP 1" sensor, and it's quite probably exactly the same sensor as this one, the differences being in zoom range and video features. Cameras like these are the future, really. The traditional SLR will inevitably fade away as fast, responsive and high resolution electronic viewfinders mean there is an alternative to the reflex mirror and prism system - the SLR system only exists because it's a convenient way of seeing exactly what the film or sensor sees through the lens, so if there is an accurate enough way of seeing this by directly interrogating the sensor then that's going to take over just as the camera phone displaced the cheap point and shoot. If indeed the new Sony RX10 Mk IV is acceptable at the 600mm end nature photographers make take to it in droves; it would be a great travel nature camera however I suspect (but don't know) that you don't get nothing for nothing and I wont be parting with my big primes just yet. I might pop into a camera shop sometime or maybe John Lewis as they have demo' cameras on show, pop one of my cards in and see if I can try it at 600. If indeed the new Sony RX10 Mk IV is acceptable at the 600mm end nature photographers make take to it in droves; it would be a great travel nature camera however I suspect (but don't know) that you don't get nothing for nothing and I wont be parting with my big primes just yet. I might pop into a camera shop sometime or maybe John Lewis as they have demo' cameras on show, pop one of my cards in and see if I can try it at 600. [quote]I suspect (but don't know) that you don't get nothing for nothing[/quote] That's true. I used to have an FZ1000. If you're never printing larger than A3, or indeed if you're never printing, it's pretty much the equivalent of a fairly good DSLR. The problem with this kind of camera is that it of necessity tries to be all things to all men - you can't change the lens so you have to pack as much capability as possible into the one you've got. The weaknesses of the super-zoom bridge are largely in the lens. They don't go ultra-wide, and image quality at the long end of the zoom range can suffer. That said, the FZ1000 is pretty good even at 400mm equivalent, although nobody would pretend it's as good as a full frame DSLR and a 400mm prime lens. There's no reason to suppose this one is much less good. Another weakness is the difficulty in getting wide apertures, which obviously is constrained by the physics of lens design and manufacture. This can make subject isolation difficult, but you can to an extent work around that by shooting from further away and zooming in. The great strength is that you do get a lot of camera for your money and it's a lot easier to carry around than an SLR and a bag full of lenses. I used to have an FZ1000. If you're never printing larger than A3, or indeed if you're never printing, it's pretty much the equivalent of a fairly good DSLR. The problem with this kind of camera is that it of necessity tries to be all things to all men - you can't change the lens so you have to pack as much capability as possible into the one you've got. The weaknesses of the super-zoom bridge are largely in the lens. They don't go ultra-wide, and image quality at the long end of the zoom range can suffer. That said, the FZ1000 is pretty good even at 400mm equivalent, although nobody would pretend it's as good as a full frame DSLR and a 400mm prime lens. There's no reason to suppose this one is much less good. Another weakness is the difficulty in getting wide apertures, which obviously is constrained by the physics of lens design and manufacture. This can make subject isolation difficult, but you can to an extent work around that by shooting from further away and zooming in. The great strength is that you do get a lot of camera for your money and it's a lot easier to carry around than an SLR and a bag full of lenses. [quote]The great strength is that you do get a lot of camera for your money and it's a lot easier to carry around than an SLR and a bag full of lenses. [/quote] Absolutely true. Quote:The great strength is that you do get a lot of camera for your money and it's a lot easier to carry around than an SLR and a bag full of lenses. It's very interesting to read the above comments about the RX10IV but they all seem to be from photographers that have not used one or probably not even seen one, are they expensive ? i guess they are, but compared to a heavy bag of kit similar to the kit I have just sold 2x K3 with grips, 5x lens big and small and other bits and bobs total value new at the time over £4000 and weighed in at nearly 10kgs, and came no where near the versatility of the RX10IV as for image quality it's incredible given the size of the camera, the biggest proportion of us by far print no bigger than A3ish or we view on our computers but it's capable of far bigger. Check out the YouTube test of a £15000 Canon camera and lens vs RX10IV they were surprised and so might you be! !